Address: 633 West Beach Blvd. Located just a short walking distance from the Shrimp Festival and Annual Hangout Music Festival, this condo is a great choice for your next family vacation. It features a large balcony with a gulf front-like view of the Gulf of Mexico, tile flooring in all rooms except bedrooms, and a fully equipped kitchen. The master bedroom has a king size bed, and second bedroom has two twin size beds. There is also a sofa sleeper in the living room. Call or email for rates and availability. 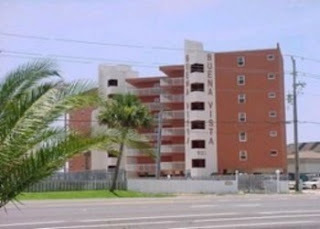 Other Gulf Shores-Orange Beach Vacation Homes, Condos, Houses . . .
Buena Vista- Gulf Side Condo With Great Views!